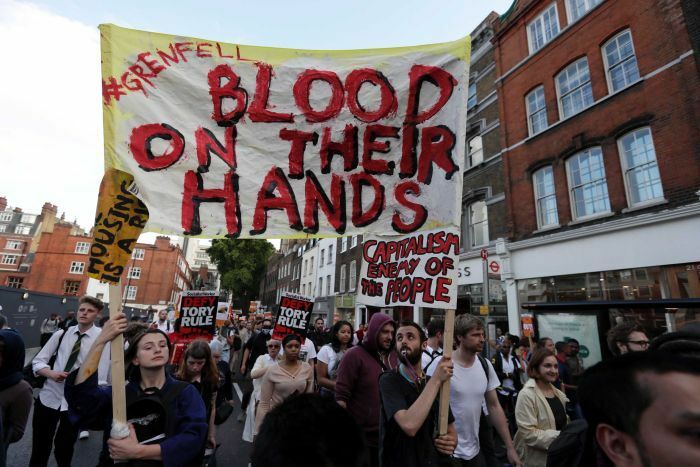 Long before the outbreak of the fire, a residents’ action group had warned of the dangerous state of the Grenfell building, but these warnings were repeatedly ignored by the local council and its agent, the Kensington and Chelsea Tenant Management Organisation. There is also a strong suspicion that the cladding which is being pinpointed as the main cause of the rapid spread of the fire was installed not for the residents of the tower but to improve the look of the building for the richer residents of the borough. Again, it is well known that this borough is infested by that new breed of absentee landlord who, encouraged by the British bourgeoisie’s mania to encourage foreign investment, buys up extremely expensive housing stock and in many cases doesn’t even bother to rent it out, but leaves it empty purely for the purposes of speculation. And indeed speculation in housing – fully supported by the state - was a central element in the crash of 2008, an economic disaster whose net effect has been to further widen the huge gulf between those with wealth and those without it. And yet keeping house prices high, especially in London, remains a central plank of today’s debt-driven casino economy. The depth and extent of the indignation provoked by such policies was such that the media owned and controlled by those at the higher rungs of the wealth ladder had little choice but to go along with the tide of rage. Some of the pro-Brexit tabloids started off by trying to blame the fire on EU regulations, but had to backtrack quickly in the face of the popular mood (but also when it was made apparent that the type of cladding used to “regenerate” Grenfell is banned in a country like Germany). A paper not famed for its radicalism, the London Metro, carried the headline “Arrest the Killers”, presented not as a quote but more like a demand, even if based on the rhetoric of Tottenham MP David Lammy who was one of the first to describe the fire as “corporate manslaughter”. And all but a minority of racist internet trolls avoided any disparaging words about the fact that the majority of the victims are not only poor but come from a migrant and even refugee background. The many expressions of solidarity we saw in the wake of the fire – the donation of food, clothes, blankets, offers of accommodation and labour in the emergency centres – came from local people of all ethnic and religious backgrounds, who didn’t ask about the personal history of the victims as a precondition for giving their aid and support. The demonstrators are right to demand answers about the cause of this fire, to pressure the state into providing emergency assistance and into re-housing them in the same area – some of them have referred to the dismal experience of those displaced by Hurricane Katrina, which was seized upon to carry out a kind of class and ethnic cleansing of “desirable” areas of New Orleans. Those who live in other tower blocks quite understandably want safety checks and improvements to be implemented as soon as possible. But it is also necessary to examine the deeper causes behind this catastrophe, to understand that the inequality which has been so widely cited as a key element is rooted in the very structure of present day society. This is particularly important because so much of the current anger is directed against particular individuals or institutions - Theresa May for shying away from direct contact with Grenfell residents, the local council or the KCTMO – rather than against a mode of production which engenders such disasters from its very entrails. Unless this point is grasped, the door remains open to illusions in alternative capitalist solutions, particularly those proposed by the left wing of capital. We have already seen Corbyn again racing ahead of May in the popularity stakes because of his more “down to earth” and sensitive response to the Grenfell residents, and his advocacy of apparently radical solutions such as the “requisitioning” of empty housing stock to provide homes to those who have been displaced. “Since the labourer passes the greater portion of his life in the process of production, the conditions of the production process are largely the conditions of his active living process, or his living conditions, and economy in these living conditions is a method of raising the rate of profit; just as we saw earlier that overwork, the transformation of the labourer into a work horse, is a means of increasing capital, or speeding up the production of surplus-value. Such economy extends to overcrowding close and unsanitary premises with labourers, or, as capitalists put it, to space saving; to crowding dangerous machinery into close quarters without using safety devices; to neglecting safety rules in production processes pernicious to health, or, as in mining, bound up with danger, etc. Not to mention the absence of all provisions to render the production process human, agreeable, or at least bearable. From the capitalist point of view this would be quite a useless and senseless waste” (Capital, vol III, chapter 5). “Cholera, typhus, typhoid fever, smallpox and other ravaging diseases spread their germs in the pestilential air and poisoned water of these working class districts”. But he also went on to say that “In these districts, the germs hardly ever die out completely, and as soon as circumstances permit it they develop into epidemics and then spread beyond their breeding places also into the more airy and healthy parts of the town inhabited by the capitalists. Capitalist rule cannot allow itself the pressure of generating epidemic diseases with impunity; the consequences fall back on it and the angel of death rages in the ranks of the capitalists as ruthlessly as in the ranks of the workers”. It is well known that the construction of the London sewer system in the 19th century, a titanic work of engineering which greatly reduced the impact of cholera, and which still functions today, was given a significant boost after the “Great Stink” of 1858 coming from the polluted Thames assailed the nostrils of the politicians in Westminster. Workers’ struggles and demands for better housing were also of course a factor in the bourgeoisie’s decisions to demolish slum areas and provide safer and more salubrious accommodation to the wage slaves. To protect themselves from disease, and to avoid the decimation of the work force, capital was obliged to introduce these improvements – besides, substantial profits could be made from investing in construction and property. But as Engels also noted, even in those days of substantial reforms, made possible by an ascendant mode of production, capitalism’s tendency was simply to shift the slums from one area to another. In The Housing Question he shows how this took place inside the boundaries of Manchester. In the present epoch, marked by the spiralling decay of the capitalist system on a world scale, the shift has most obviously taken place from the more “advanced” capitalist countries to the immense slums that surround so many of the cities of what used to be called the “Third World”. This was why, rejecting Proudhon’s utopia (subsequently revived in the Thatcherite project of buying your own council house, which has considerably intensified the housing problem) where every worker owns their own little house, Engels insisted that “As long as the capitalist mode of production continues to exist, it is folly to hope for an isolated solution of the housing question or of any other social question affecting the fate of the workers. The solution lies in the abolition of the capitalist mode of production and the appropriation of all the means of life and labour by the working class itself” (The Housing Question). The proletarian revolution in Russia in 1917 gave us a glimpse of what, in its initial stages, this “appropriation” might mean: the palaces and mansions of the rich were expropriated in order to house the poorest families. In today’s London, alongside actual mansions and palaces, the dizzying increase in speculative building over the past few decades has left us with a huge stock of prestige towers, some parts of which are inhabited by a few wealthy residents, some parts of which are used for all kinds of parasitic commercial activities, and many parts of which remain unsold and unused. But they certainly have better fire safety systems than Grenfell. These types of buildings are a primary argument for expropriation as an immediate solution to the scandal of sub-standard housing and homelessness. But Engels, like Marx, stood for a much more radical programme than simply taking over existing buildings. Again, rejecting the Proudhonist fantasy of a return to cottage industry, Engels stressed the progressive role played by the big cities in bringing together a mass of proletarians capable of acting together and thus challenging the capitalist order. And yet he also insisted that the communist future would have gone beyond the brutal separation of town and country and that this involved the dismantling of the great cities - a project even more grandiose in today’s epoch of swollen megacities which make the great cities of Engels’ day look like minor market towns. “On its own admission, therefore, the bourgeois solution of the housing question has come to grief-it has come to grief owing to the antithesis of town and country. And with this we have arrived at the kernel of the problem. The housing question can only be solved when society has been sufficiently transformed for a start to be made towards abolishing the antithesis between town and country, which has been brought to an extreme point by present-day capitalist society. Far from being able to abolish this antithesis, capitalist society on the contrary is compelled to intensify it day by day. On the other hand the first modern utopian socialists, Owen and Fourier, already correctly recognized this. In their model plans the antithesis between town and country no longer exists. Consequently there takes place exactly the contrary of that which Herr Sax contends; it is not the solution of the housing question which simultaneously solves the social question, but only by the solution of the social question, that is, by the abolition of the capitalist mode of production, is the solution of the housing question made possible. To want to solve the housing question while at the same time desiring to maintain the modern big cities is an absurdity. The modern big cities, however, will be abolished only by the abolition of the capitalist mode of production, and when this is once on the way then there will be quite other thing to do than supplying each worker with a little house for his own possession” (The Housing Question). “When, after the forcible crushing of this ever-more obscene dictatorship, it will be possible to subordinate every solution and every plan to the amelioration of the conditions of living labour , to fashion with this aim everything that has come from dead labour, from constant capital, from the infrastructure that the human species has built up over the centuries and continues to build up on the earth’s crust, then the brutal verticalism of the cement monsters will be made ridiculous and will be suppressed, and in the immense expanses of horizontal space, once the giant cities have been deflated, the strength and intelligence of the human animal will progressively tend to render uniform the density of life and labour over the habitable parts of the earth; and these forces will henceforth be in harmony, and no longer ferocious enemies as they are in the deformed civilisation of today, where they are only brought together by the spectre of servitude and hunger”.
. From Corbyn’s state capitalist perspective, the requisitioning of buildings would not be the result of self-organised initiatives by the working class, but of legal measures taken by the state, similar to the requisitioning of buildings in war time.